Good Stuff NW: Waiter, There's a Walnut in My Drink! Waiter, There's a Walnut in My Drink! Caponata with a Twist: Winter Squash! 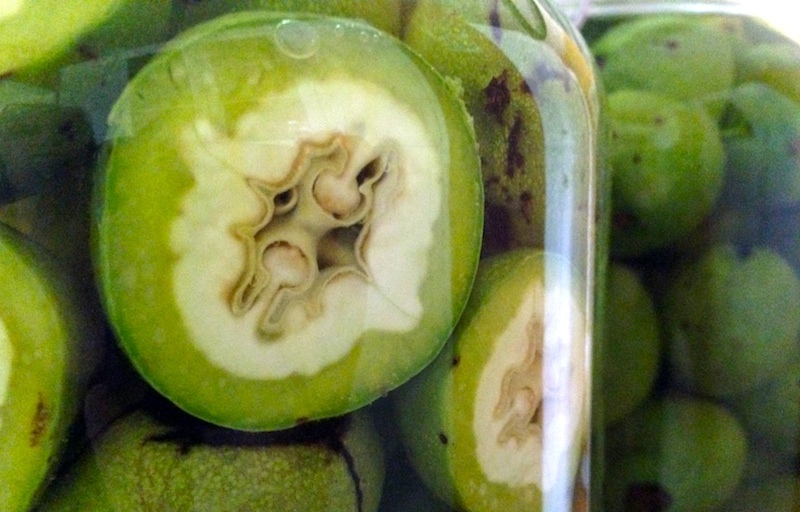 I've just made my third batch of nocino, that motor oil-dark Italian liqueur made from unripe walnuts, green as spring grass, hard as rocks and, when split open, with the nutshell discernable but not yet hardened. Fortunately for Portlanders, there were lots of walnut trees planted for landscaping purposes from the city's founding and well into the 20th century. Which means that in late summer, there are lots of walnuts (un)ripe for the picking. Infusing in alcohol on the patio until fall. That first batch was spectacular, a rich, dark elixir that smelled and tasted of walnuts and that, six years later, is still some of the best I've ever had, though there's only a thimble-full left. I made another attempt two years ago, but it somehow never came together the same way. 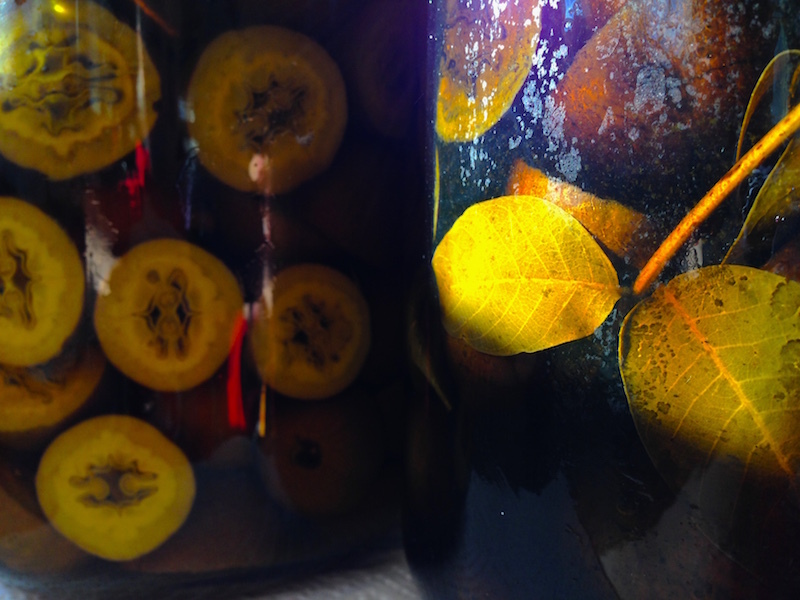 I found out why when I made this year's nocino. After draining off the solids, it was time to add the sugar syrup and, reading the recipe carefully to make sure I got the balance right, I realized that I'd misread the recipe two years ago. D'oh! So I quickly got out that batch, which I hadn't had the heart to throw out, and added in the missing portion of syrup. È eccellente! Between the two batches I now have around three gallons of liqueur in my cellar, which brings me to the point of this post. I've run across several articles touting the excellent cocktails that can be made with the addition of a touch of nocino, and Dave and I have been diligently working our way through them. 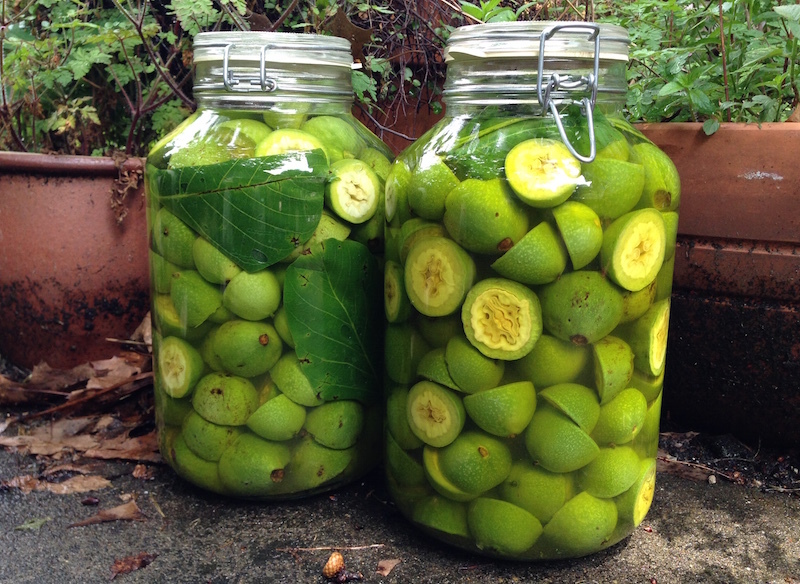 If you've been wanting to try nocino, there are several commercial varieties out there, but I can honestly say that none have measured up to Jim's homemade version, which includes nothing but alcohol and walnuts, eschewing the exotic spices that many add. But please, feel free to experiment with the following cocktails and, if you're so inclined, find a neighbor with a tree and make your own nocino next year! Combine ingredients in a mixing glass half full of ice. Stir until chilled. 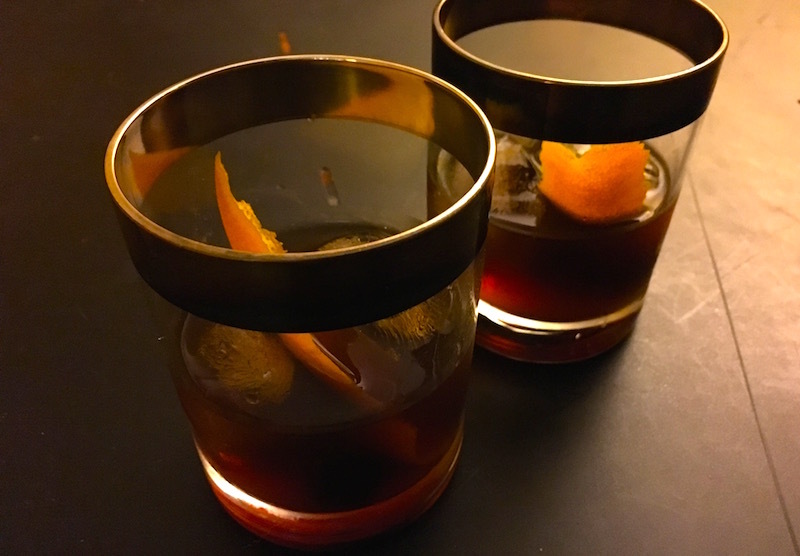 Strain into tumbler with two fresh ice cubes. Garnish with two amarena cherries. Serve. Chill cocktail glasses in freezer. Fill pint glass or small mixing pitcher half full of ice. Add whiskey, nocino and bitters. Stir 30 seconds. Take cocktail glasses out of freezer. Strain liquor into glass. Drop two cherries into each glass. Serve.